In August of 2010, the internet buzzing about two folks that had very publicly quit their terrible jobs. But while Steven Slater quit his job as an airline steward for JetBlue with righteous fury and indignation, a cute office worker named "Jenny" took a much more comedic route. 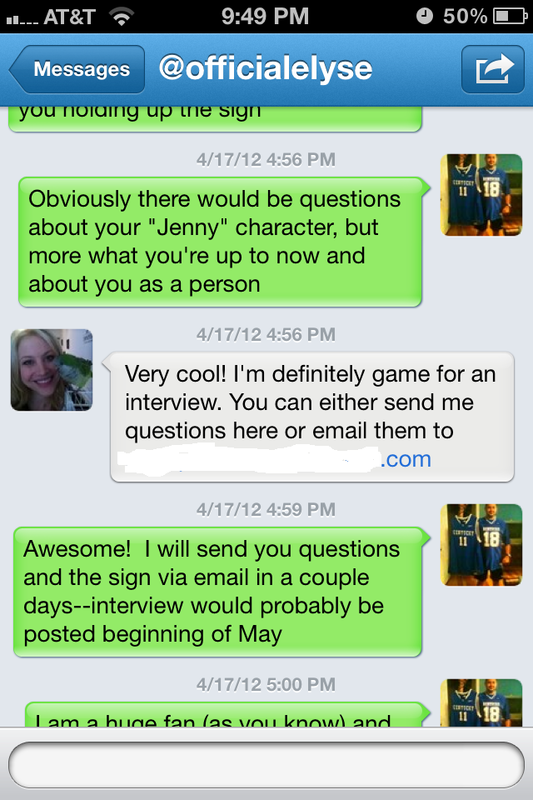 TheChive.com posted a series of pictures that Jenny, (a girl from an unnamed brokerage) had sent all her co workers. They showed her holding a dry erase board and laying the hammer down sentence by sentence to her horrible boss named Spencer, all the while flashing a beautiful smile. This incredible resignation letter tapped into a reserve of populist rage felt by an overworked and under appreciated workforce along with a general disdain for anything having to do with Wall Street. 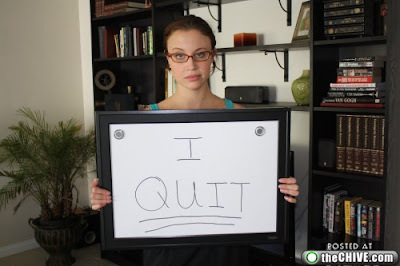 She not only had the guts to very publicly quit her job, but completely destroyed her terrible boss. 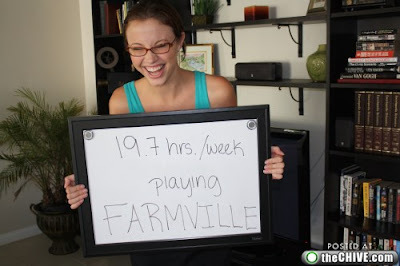 She even used her computer access as his (former) assistant to expose Spencer's habit of playing Farmville at work. 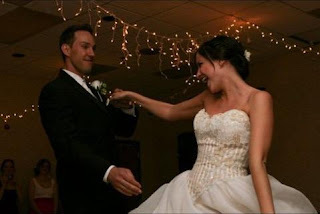 Sadly, Jenny's incredible backhand smack to "The Man" turned out to be a hoax. It had been set up by theChive long before the JetBlue incident (but ended up coinciding very well with it) and was done as a practical joke. While many of us were disappointed that "Jenny" wasn't real, we were still very impressed/smitten with Elyse Porterfield, the actress that had portrayed our proletarian hero. Despite never saying a word, this girl was able to portray a fairly impressive array of emotions and convince many of us that this was a real occurrence simply with her facial expressions (and for those of you that think "eye acting" is easy, watch this video and get back to me on that). 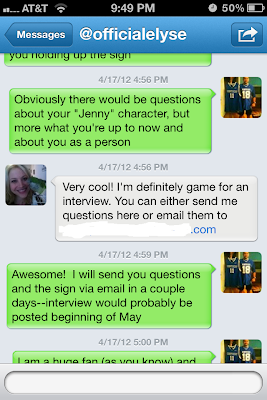 Elyse immediately followed her "Jenny" role with a feature in askmen.com and appeared in ads for Expo Markers. As the young actress began taking on small television/movie projects and expanding her career, however, she still managed to do a great job keeping in touch with her fans...of which I am a HUGE one. RBC: Before you were introduced to the world via your role as Jenny, what were you doing? Elyse: I had literally just moved to LA in May and I was still getting settled. I was going to auditions here and there, and I was working background on the feature film, Project X.
RBC: You have a BA in Musical Theater; what are some of your favorite roles you've played or want to play some day? Elyse: I loved playing Nancy in Oliver and Martha in The Secret Garden. They were my favorite roles, and my favorite shows that I have been a part of. I would love to play Belle in 'Beauty and the Beast, Elphaba in Wicked, and Kathy in The Last Five Years. I've always dreamed of playing Eponine in Les Miserables as well. RBC: Is there anything else you'd like to do with your singing, or is acting currently your main focus? Elyse: Acting is my main focus right now because I've always wanted to work in film and television, but I LOVE singing. I sing around the house, in the car, pretty much everywhere I go. I would love to do more musicals, though. Once I'm done with the Hollywood world, I'll probably be found doing community theatre. :) I love it! RBC: Have you always wanted to be an actress? Elyse: Yes, since I could walk and talk! RBC: Do you remember your first dramatic role? (mine was Sam the Sad Circus Clown in 1st grade, but the bright lights and fame just weren't for me). Elyse: My first big acting experience was playing an orphan in the musical Annie when I was 9. RBC: Okay, personal question time: How did you and your husband meet? 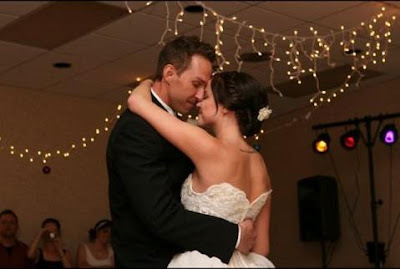 Elyse: We met in the funniest way: I was a cave tour guide (yep, I guided cave tours every summer since I was 15! I love spelunking!) at Glenwood Caverns Adventure Park, and he was the bass player of a local bluegrass band. I knew that there was a band playing at our restaurant that evening, but I had no interest in staying until I saw him. Yes, the bass player really does get the girl, sometimes. I was just coming up from my last tour of the day and our eyes locked. It sounds cheesy but it was like magic! I stayed and listened to his band (they were really awesome), and afterwards we went out for drinks. The rest is history! It's crazy because I remember something clicking in me the second I saw him! It was definitely love at first sight. RBC: What does the tattoo on your back say? ...besides "I'm elegant, but still kind of a badass." Elyse: Thanks for asking! It says "Trust in the Lord with all your heart" referring to Proverbs 3:5. Advice I live by every day! RBC: It's been almost two years since Jenny quit her job and dropped the hammer on Spencer--how much did that role change your life help you move your acting career forward? Elyse: Honestly, I wish I could go back and do it all over. It really did change my life for the better and it's given me some amazing opportunities, but I would have handled things so differently if I would have known then what I know now. I think I would have really given it my all to propel myself forward, but instead I just kind of enjoyed the ride. I have no regrets though because I LOVE where I am now, and I feel like I have accomplished so much for only living in this town for two years! Being Jenny has allowed me to meet so many amazing people, and go to some awesome places. It's really cool when I meet a celebrity and they know who I am. That's just surreal. RBC: What type of roles and projects have you worked on since then and what type of stuff do you have coming up? Elyse: I have really been focusing on making some good industry connections. If I'm not at an audition or taking a day off, I usually work as background on TV shows and movies. I love it because I've gotten to know a lot of influential people in the business and I get to be on set! I have literally worked on too many shows to name, but I am featured on a couple of upcoming episodes of Parks and Recreation! Right now my main focus is on trying to get a decent agent. I have already been through 3 out here, and unfortunately there are more bad apples than good ones. RBC: Do people ever say "Oh, you're that girl who quit her job with the dry erase board!" when you come in for interviews? Elyse: All the time. It would actually make me mad sometimes because I had some very powerful people in the industry call me in for meetings. I was excited to meet with them, and then it turned out that they just wanted to meet me. Very frustrating, but I love it when people recognize me on the streets, on set, or in auditions. It definitely gives me an advantage! RBC: Okay, confession time: I know you're a big fan of 'The Office.' One of my dreams for the show (besides to be funny again) is for them to have an episode where Michael Scott comes back for a visit (obviously), but with you in it as a guest star. At some point during the episode, he's doing some sort of presentation using a white board that he's having you hold it up the entire time. You roll your eyes and say "this is so beneath me..."
Elyse: Ummm, lets make that happen!!! RBC: That all being said, I know your incredibly appreciative of the opportunity the "Jenny" role gave you, but do you ever wish your vocal background had taken off more in the same way that your acting did? Elyse: I wish more people had the chance to hear me sing! I have a pretty awesome voice, and I'd love to get into voice over work as a Disney Princess or something. I am extremely appreciative though. It got my name out there in a good way, and that's what matters to me. I have plenty of time to build off of that. The "Jenny" hoax gave me a great starting platform. RBC: Where do you see yourself (or hope to be) in a few years? Elyse: I hope that in the next few years that I have just made progress! I could say I hope to be a lead in a movie or a regular on a TV series (all things that I want and hope for), but I will be happy as long as I am doing what I love and moving forward in my career. RBC: Okay, random stuff: One of your last twitter profile pics is of you and a bird. What's your bird's name? (and is he/she as friendly as he seems in your pictures...because birds always seem to hate me for some reason). Elyse: Uh oh, once I start with this it's gonna be hard to stop! His name is Charlie and he is the most amazing thing on the planet. He talks like crazy, and he even sings along to songs and TV shows like Glee! 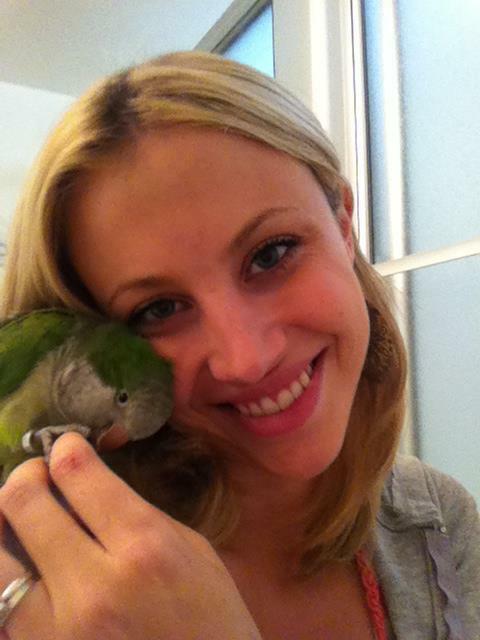 He also loves to cuddle and when I call him, he will fly to me like I'm a princess. (who would have scratched my eyes out if I had tried that pose with him). He's just so incredible and scary smart. He will start saying new words all on his own! 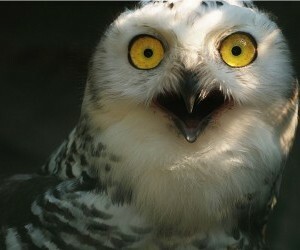 I'm so fascinated by birds because they are such amazing creatures, and they're so happy! Think about how tiny their brains are, and yet they are just so smart! If I was to ever give up acting, the only thing that would give me an equal amount of joy would be working for a bird rescue. I'm obsessed with them! RBC: Do you have any other pets? Elyse: I don't, but my bonus son Chandler (16) has a Bearded Dragon named Bubba and a Leopard Gecko named Gizmo. They're pretty awesome and very chill. RBC: You're really good about staying connected with your fans, which means you've had to have some weirdos come out of the woodwork. What's one of the strangest fan contacts you've had? Elyse: To be honest I really haven't had many strange interactions. I do get random people that will message me creepy things, but I just ignore those. :) Everyone else is awesome and I love interacting with them on facebook and twitter. I felt like I've actually gotten to know some people and make new friends, it's really neat to connect with people all over the world. RBC: I read in another interview you did that you had to deal with some pretty difficult people in your college's musical theater department (I was a music major in college, as well, so I have no problem believing that). Have you ever wanted/been tempted to send any of them their own personalized white board message? Elyse: Oh, I'm much more aggressive than that. I've been tempted to hit some of them with a car! Haha, I'm just kidding. I think I would have to much to say to be able to fit it on a white board! I am one of those people who really tried to get along with everyone, but I refuse to conform. That was a problem for me at my school because it was like a popular high school clique. It was a miserable 4 years and I almost dropped out so many times, but I'm really glad I didn't because there were some good people mixed in with all the rest, and I graduated with really thick skin. RBC: You recently decided to go blonde. What made you decide to fully embrace the evil side of your nature? Elyse: I actually went back to blonde. I switch it up every few years and was blonde when I met my husband. He really likes it blonde and I was ready for a change. Don't get too comfortable with it though, I could be a red head tomorrow; I love changing up my hair. No Katy Perry though! RBC: You're a huge Broncos fan. Like me, you seemed to spend much of last season reveling in Tim Tebow making experts and cynics pull their hair out and scream with rage. I want to hate Elway for dumping Tebow and getting Manning...but it's Peyton Manning! I'm pretty torn, myself. How do you feel about it? Elyse: Oh my goodness I'm so angry! Tebow did so much for the Broncos and I feel like they just dumped him!!! I understand why they did what they did, but I think it was wrong and it's something they'll regret when Manning retires in the near future. RBC: Will you still root for the Bronocs next year? And an even more chilling question...will you be willing to root for the New York Jets? Elyse: The Broncos will always come first, but I'll root for Tim Tebow wherever he goes. RBC: Anything else you'd like to say or promote to your fans out there? Elyse: Thank you so much for all your support and friendship! That's the best thing that came from the hoax, and it's so wonderful getting to know so many different people! RBC: If you'd like to follow Elyse's rise to stardom, see more photos of her, or listen to her vehemently complain about Los Angeles traffic, you can follow her on twitter @officialelyse or join her Facebook fan page.